In recent years, increased use of mobile devices has changed the way we interact with the web and new coding options has changed the experience we create for users. In this article, I will cover mobile site set up and some tips for auditing for potential issues. If you’re using CSS3 to modify webpage displays based on screen size, you don’t need to make any modifications to pages since you’re not changing URLs. For Google, using this type of responsive design is the recommended configuration. Sidenote: Be really careful here if you’re looking at older resources because in Matt Cutt’s video, he states that he recommends using a subdomain. Google does recommend for you to use vary server headers if you are serving different HTML on the same URL, which tell crawlers that the HTML that is served up may vary with the user agent. This helps Google serve the proper cached page and helps Google find your mobile optimized content faster. Google provides further instructions on how get this configured here. If you’re using two separate codebases, one for the desktop version of your site and a separate mobile version of your site on subdomain (etc..), you have to do a little bit more. In these cases, it is recommended to use 301 redirects from the desktop version of the site to the mobile version of the site and the other way around. A very common question we see is: Does it matter if the different types of content are served from the same URL or from different URLs? For example, some websites have www.example.com as the URL desktop browsers are meant to access and have m.example.com or wap.example.com for the different mobile devices. Other websites serve all types of content from just one URL structure like www.example.com. Also, here is a useful video that Matt Cutts Did on the topic, which you can view here. How to audit for this: If you want to audit if you are using the right kinds of redirects, many of the simple header checkers out there are likely not to work. The first thing you need to do is download a user agent switcher. If you’re using Google or Chrome, you can download a user agent switcher plug in. Set the user agent to googlebot-mobile and use firebug, another plugin, set to the network tab (view all sub tab). You will want to check a desktop URL set to a mobile user agent and the other way around. rel=”alternate”: points the to the mobile version of the given page and helps Google discover the mobile versions of your pages more easily. rel=”canonical”: points back to the desktop version of the page, to show that it is the main version of the page. Another option that Google provides for laying this out is using your sitemap. Depending on the kind of website you have, this option may be easier. 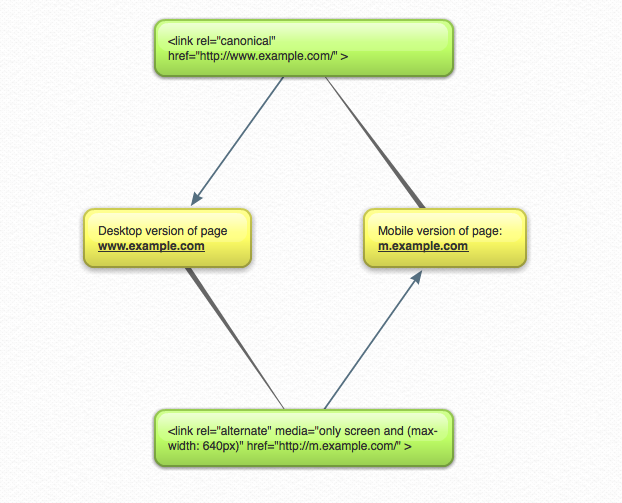 The below illustrates how the annotation would look in an HTML sitemap. Keep in mind though, Google still recommends using rel=”canonical” back to the desktop version of the page, even if you use the sitemap method. The last piece of the mobile content puzzle is to submit a mobile sitemap in Google Webmaster Tools, if you haven’t already. This is not an absolutely critical step but it can help with some indexing. Google has a small help section for mobile sitemaps. Keep in mind though, Google has fairly specific guidelines for how they would like the sitemap to look, which are worth a look. Google Developers Information Center For Mobile, By Google – There is a lot of dated information on mobile. Google had put this information center together around last July to clear the air around some of the ambiguity surrounding mobile optimization. This is the most up to date information I have found on this topic. Help Google Index Your Mobile Site, By Google – The really useful part here is the quick tip to use the site: command to see if your mobile website is not being indexed. honestly, I am glad I started following this page. Exactly what I want from Facebook pages I follow. Propper, usefull information once or twice a day. Also this very topic was something I was just about to digg in to and voila, here we go. Great piece of information ! Much apreciated ! Thanks so much for the nice words, Denis! We’re glad you’re finding our page helpful. I absolutely do find it helpfull. Please do me a great favor and keep up the good work. Helpful Insight for mobile site owner! Well, in my case, I am using dynamic serving option for mobile site. Then, I have created a mobile sitemap for mobile version of my website i.e. same urls with mobile tags and namespace. But in webmaster central when i check for index status of mobile website it has divided it into two rows “Web” and “Mobile” It is shwing index status following to web but there is no url index following mobile row. Please provide a solution to that. As the web continues to shift to mobile this is a very important topic. You want to make sure that it’s done properly. You don’t want to end up with a duplicate content issue across different versions of a site. At blooming last – a post about mobile seo that includes both canonicals from mobile to desktop and rel=”alternate” from desktop to mobile. There is just much misinformation out there that small business owners don’t know if they’re coming or going.